LAB.PRO.FAB. (Alejandro Haiek), view of LIGA 16: Paperwork, 2014, Mexico City. Photo: Luis Gallardo, LGM Studio. LIGA–Space for Architecture is an exhibit-oriented platform that focuses its efforts in displaying emerging and influential architectural practices whose origin is Latin America, to transplant interesting proposals between culturally parallel countries and reach a larger audience. 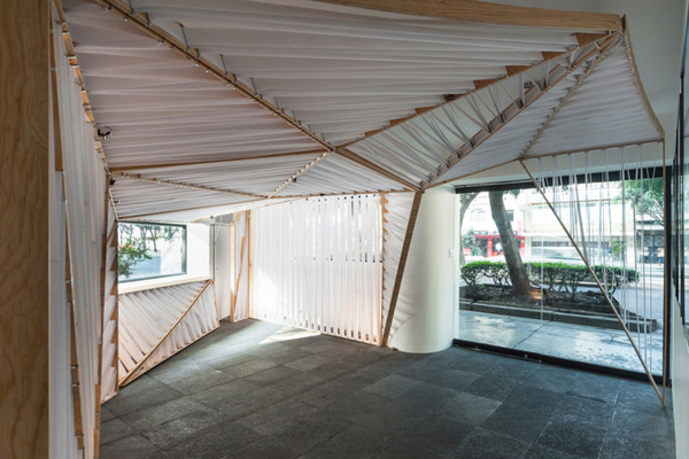 Each exhibition is a site-specific installation that explores the unlimited ways of making an architectural exhibition, an activity recently developed in Latin American countries that continues to gain importance. Each exhibition looks for the guest architect to find an innovative way of displaying their line of work, trying to avoid the classical expositive standards. Simultaneously with the annual exhibition program, LIGA offers a forum that combines a variety of disciplines that can relate to the architectural practice. For this, there is a set of lectures (approximately one every quarter) that aims to broaden the spectrum of approaches and interpretations inherent to a geographical construct by presenting such space to a young architectural audience, promoting the evolutionary essence of both the program and the discipline of architecture. The program for 2014–2015 includes, among others, the work of the Venezuelan architect Alejandro Haiek (Lab.Pro.Fab) and the Mexican Studio Macías-Peredo. To select the architects for the exhibition Number 20 LIGA-Space for Architecture will organize its first open call for proposals: an international competition open to Latin American architects that will be launched on September 02, 2014. LIGA 16: Paperwork. Artist: LAB.PRO.FAB (Alejandro Haiek). Office founded in 1996 in Caracas, Venezuela. LAB.PRO.FAB is an architectural studio led by Alejandro Haiek. His projects are closer to the design of a logistic chain of events than to massive construction, promoting social and cultural dynamics centering on art, the applied sciences, and local intelligence. He is cofounder and director of LAB.PRO.FAB, a laboratory of design and fabrication that gathers all the disciplines related to design in order to carry out research applied to cultural, social, and environmental development. Haiek has taught and lectured in Chile, Ecuador, Colombia, Costa Rica, Mexico, the United States, Spain, and Japan and his work has been published and exhibited worldwide. LIGA 17: Summoning Stones. Artist: Estudio Macías Peredo. Office located in Guadalajara, Mexico. 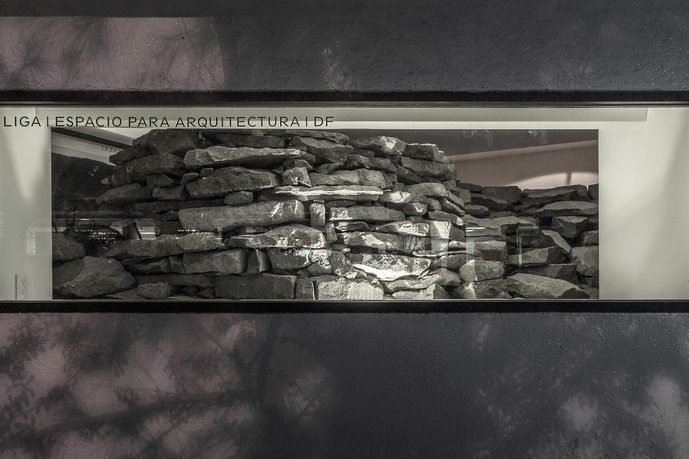 Estudio Macías Peredo is based in Guadalajara and led by Salvador Macías and Magui Peredo, who met at the Instituto Tecnológico y de Estudios Superiores de Occidente (ITESO) in Guadalajara, where they both earned architecture degrees and returned to teaching afterwards. They continued their education together, pursuing graduate degrees at the Universitat Politècnica de Catalunya in Barcelona, Spain. Due to the specific local conditions in which manual labor continues to dominate most means of production, a hands-on attitude and a craftsman-like approach to building is at the heart of their architecture. As the architects state: "We like to think that our work is about a continuity of construction processes, materials, and skills that are nearing extinction because of contemporary ideas of progress. It is not nostalgic. We truly believe there are still opportunities and valuable contributions to architecture in this track. That's why we use references that invoke primitive Mexican buildings." 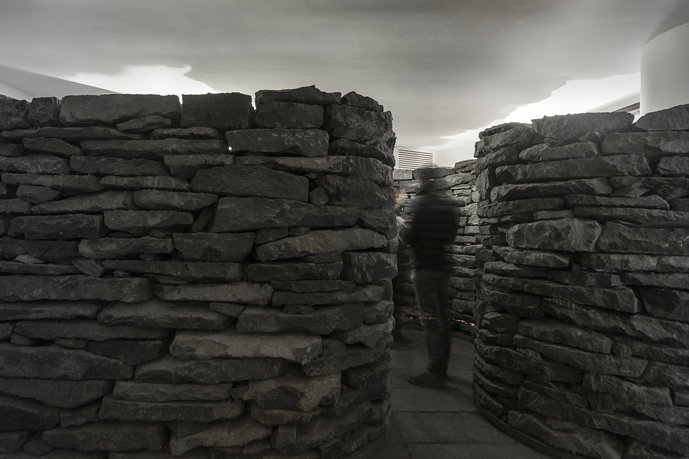 They were recently selected for the Emerging Voices series, organized by the Architectural League of New York. LIGA 18: Jardineira. Artist: TACOA. Office founded in 2005 in São Paulo, Brasil. TACOA Arquitetos was founded in 2005 by Rodrigo Cerviño and Fernando Falcon, both architecture graduates of the Faculty of Architecture and Urbanism of the Universidade de São Paulo, FAUUSP, Brazil. 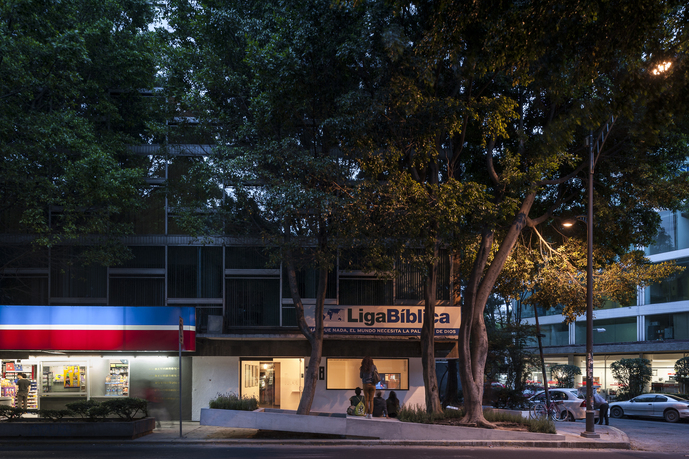 The studio is responsible for projects such as Galería Adriana Varejão (2008), winner of the awards O Melhor da Arquitetura, 2010 and IAB, Rino Levi, 2008; Plot 40 Residence (2010); the Galpão Fortes Vilaça (2008); Vila Aspicuelta finalist for the prize Wan Concrete in Architecture in 2014; and the Pivô Cultural Center (2013). TACOA was a finalist on the public offering of the new headquarters of the Museum of Image and Sound in Rio de Janeiro in 2010. The office participated in the exhibition The Impossible, architectural concept for a possible exhibition, in Madrid (2011). The architects also took part at the 33 Overview of Brazilian Modern Art in São Paulo: Formas únicas da continuidade do espaço. Ruth Estévez is the director and curator of the Gallery at REDCAT, Los Angeles, CA. Between 2007 and 2011, Estévez served as chief curator at the Museo de Arte Carrillo Gil, Mexico City, where she curated various exhibitions and projects with artists such as Mark Manders, Guy Ben-Ner, and Fernando Ortega, among others. 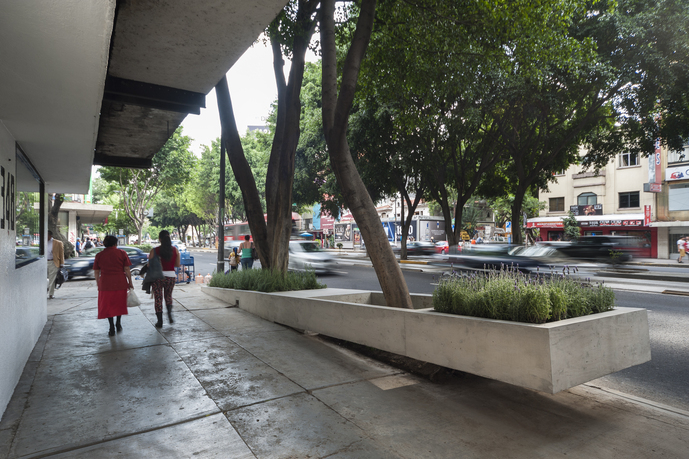 In 2010, Estévez cofounded LIGA-Space for Architecture in Mexico City, the first space in Latin America devoted to the critical reflection and presentation of architecture. Estévez has written extensively for various exhibition catalogs and art publications and has independently organized exhibitions in Spain, Belgium, and the United States, as well as in Mexico. She holds a master's degree in art history from Mexico's National Autonomous University (UNAM,) where she is a PhD candidate. 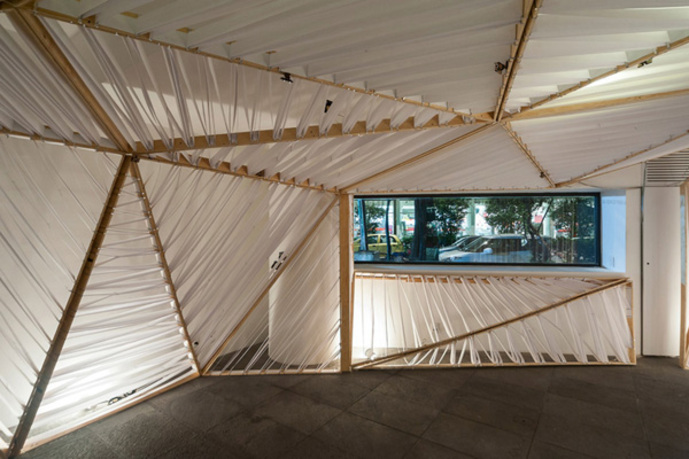 LIGA-Space for Architecture, is an exhibition platform based in Mexico City. Founded in January 2011, its aim is to promote the exchange of ideas and research around contemporary architectural practices. The space is focused on contemporary Latin American architecture; this, however, has less to do with the vindication of a cultural identity and more with the possibility of revising the dichotomies and existing processes in emerging practices. There is a set program for its exhibitions, which take place every three months. Parallel to the regularly scheduled exhibits, LIGA Interludes is a program where different agents from a multiplicity of disciplines are invited to deliver lectures, workshops, and screenings.